Wealth and power are themes that preoccupy much of Greek literature from Homer on, and this book unravels the significance of these subjects in one of the most famous pieces of narrative writing from classical antiquity. Lisa Kallet brilliantly reshapes our literary and historical understanding of Thucydides' account of the disastrous Sicilian expedition of 415–413 b.c., a pivotal event in the Peloponnesian War. 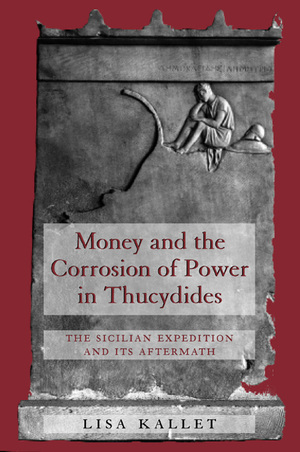 She shows that the second half of Thucydides' History contains a damning critique of Athens and its leaders for becoming corrupted by money and for failing to appropriately use their financial strength on military power. Focusing especially on the narrative techniques Thucydides used to build his argument, Kallet gives a close examination of the subjects of wealth and power in this account of naval war and its aftermath and locates Thucydides' writings on these themes within a broad intellectual context. Among other topics, Kallet discusses Thucydides' use of metaphor, his numerous intertextual references to Herodotus and Homer, and thematic links he makes among the topics of money, emotion, and sight. Overall, she shows that the subject of money constitutes a continuous thematic thread in books six through eight of the History. In addition, this book takes a fresh look at familiar epigraphic evidence. Kallet's ability to combine sophisticated literary analysis with a firm grasp of Attic inscriptions sheds new light on an important work of antiquity and provides a model example of how to unravel a dense historical text to reveal its underlying literary principles of construction. Lisa Kallet is Associate Professor of Classics at the University of Texas, Austin, and the author of Money, Expense, and Naval Power in Thucydides' History 1-5.24 (California 1993).